Jan Hagler is the former City Administrator of Bethany, Missouri. She was a featured speaker at our recent webinar, “Soup to Nuts: The Power of Contract Operations” webinar. During the online discussion, Hagler provided insight and fielded questions about why communities across America, like Bethany, have turned to contract operations for their water and wastewater operations. In Hagler’s experience, there were many common obstacles in Bethany’s water and wastewater operation she noticed could be remedied or eliminated by outsourcing services to PeopleService. An aging workforce, training requirements, updating facility equipment and recruiting new, lasting talent were just a few of the challenges the town faced. After the town contracted with PeopleService, Hagler noticed remarkable changes and less worry. After a period of transition, she especially appreciated how the experienced, licensed staff was available 24/7 to troubleshoot and respond to any issues. Hagler goes on to explain the economic developmental impact of the partnership, particularly when it came to planning for upgrades and replacements. PeopleService helped map out the town’s entire public works system including water, wastewater, electric, gas – everything. PeopleService facilitated the overhaul by establishing a list of priorities, assessing scope and budget and creating a schedule and timeline of work. PeopleService’s excellent records management, leadership initiative and community investment were some of the reasons Hagler said the town was so pleased to have outsourced Bethany’s water and wastewater services. 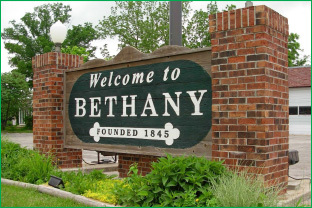 The partnership has created a significant impact on Bethany, now prepared to sustain future generations. Would you benefit from outsourcing your water/wastewater operations and management? We’d love to talk to you and show you how partnering with PeopleService can help you update your system – and gain peace of mind. Just contact Chad Meyer at 877-774-4311.